We must look after our planet. The best way to do this is by using renewable resources and recycling those we have already used. 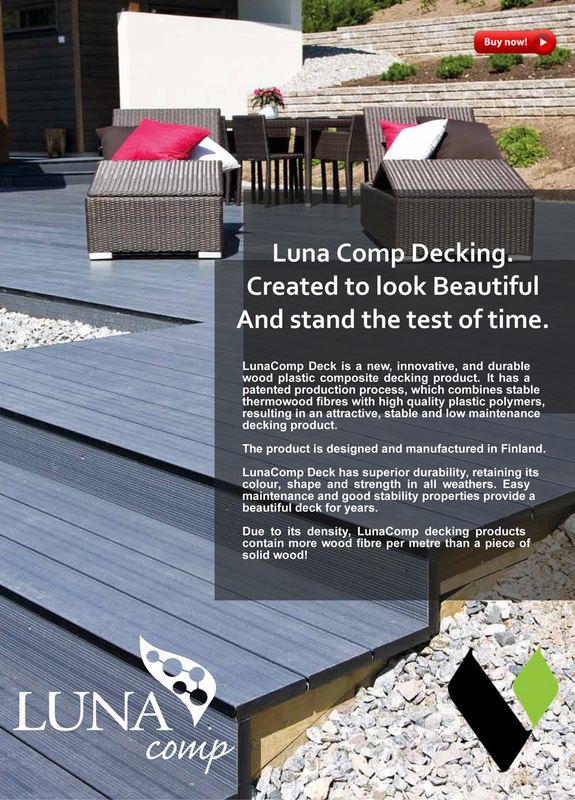 LunaComp decking products are made from an innovative wood plastic composite, using modern, efficient manufacturing techniques. 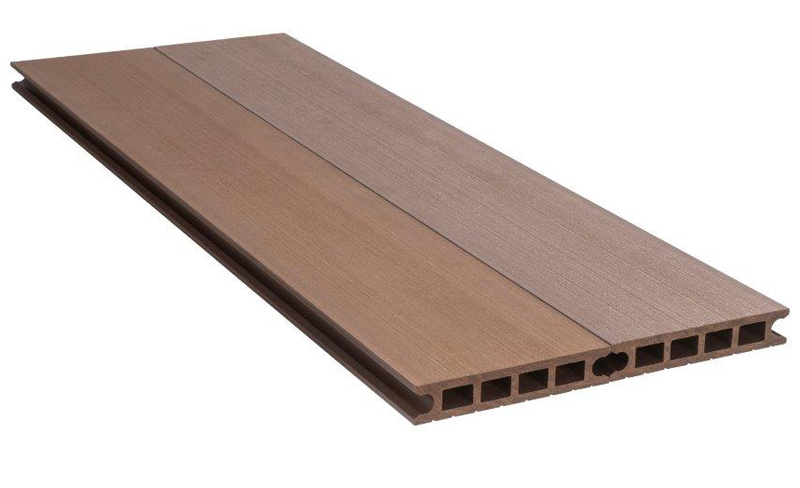 The principle ingredients in LunaComp Deck are thermally modified wood fibres and recycled polypropylene. The wood fibres are a by-product from the production of Lunawood and make up approximately 65% of LunaComp's mass. The polypropylene is 100% recycled and non-toxic to the environment. No PVC is used. Production of LunaComp Deck does not produce any waste products. Even the water is re-used in a closed loop system. 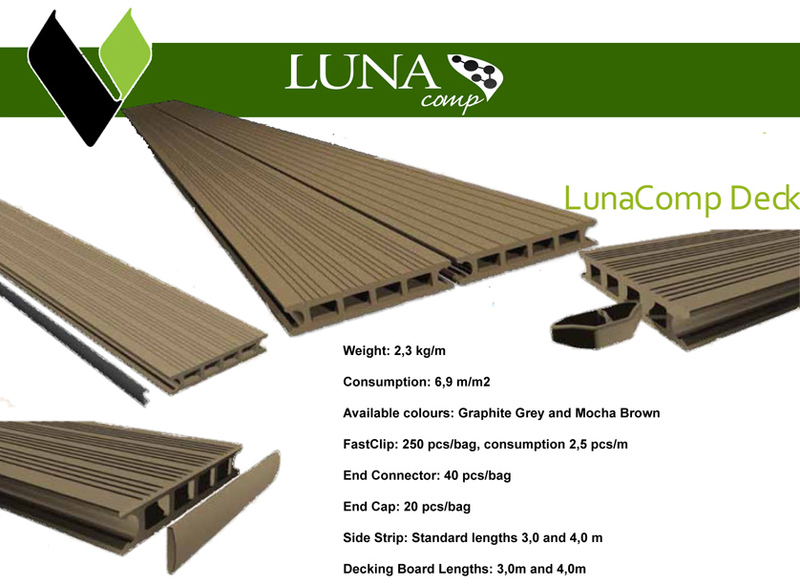 LunaComp Deck is manufactured on the same site that the Lunawood fibres are produced, so there is no transport required. 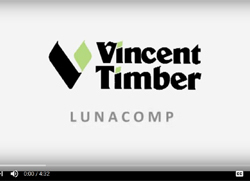 And should you wish to replace your LunaComp deck, it can be recycled to produce more LunaComp products or disposed of with your ordinary household waste. 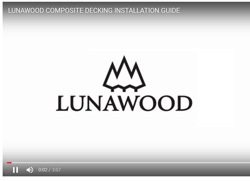 The inherent advantage of LunaComp Deck is the use of Lunawood fibre. During the thermal modification process, Lunawood undergoes physical and chemical changes that give it a natural durability against decay along with dimensional stability in heat and humidity. The result is that, with little maintenance, your deck will remain beautiful year after year. Heat Expansion effects when temperature changes. Coefficient of heat expansion 0.02 m m / 1°C / 1m. 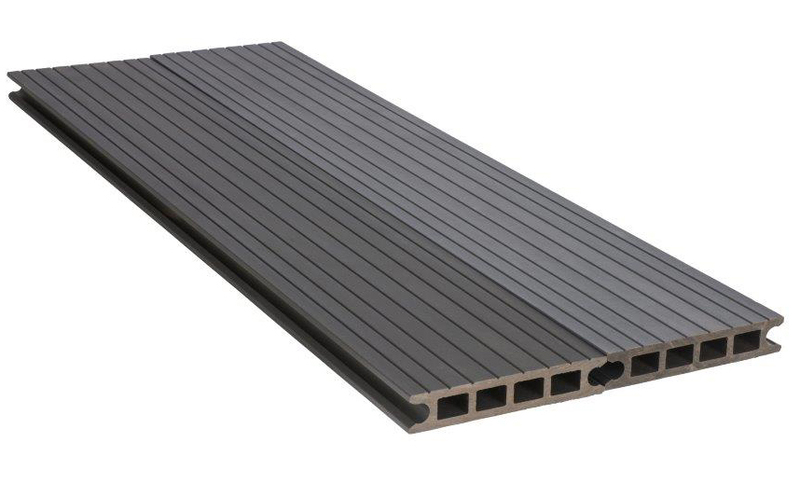 With its hard surface, wear resistance and significant friction, LunaComp Deck is ideal in hotels, restaurants, around pools and marinas and of course, in your home. 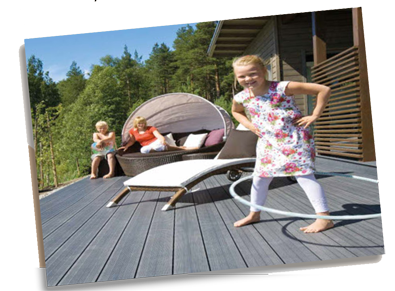 LunaComp Deck feels comfortable under bare feet but, unlike solid wood decks you need not have any worries about splinters. Not only does your LunaComp Deck look good and have a long service life, but it is easier to maintain than solid wood decks. No surface treatment is required and when the deck does get a bit mucky after a party, simply brush with warm water or gently pressure wash. Pressure should not exceed 100 bar or be applied closer than 30 cm from the deck. We recommend that fresh stains are cleaned promptly with warm water and a neutral cleansing agent. 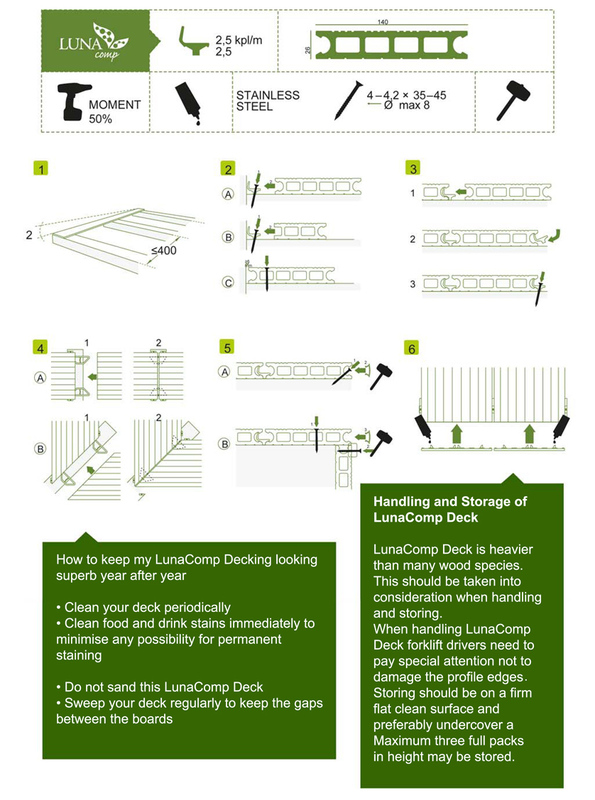 LunaComp Deck does not fade and it retains its colour well. In the first few months after installation, the colour will fade a little as the product settles. The picture below shows the rate of fading in a typical north European climate. Once the product has settled, there will be no further loss of colour, even after washing. The NEW product is on the left and the weathered product is on the right.